Vitalsox exclusive silver Dry Stat- Vitalsox technical performance material designed using quick drying polypropylene infused with silver to resist and stop the growth of bacteria and fungus while it repels odor from the socks. Your feet may still smell but your socks will not hold odors, easy care turn inside out and machine wash warm. The only patented compression- how is it different, it is graduated starting at the mid foot for plantar ligament an arch support, our compression is tested individually during manufacturing to the ideal range for maximum circulation increase. The feet are the furthest point from your heart by increasing fresh oxygenated blood to your damaged tissues by up to 40% faster recovery time and athletic performance is enhanced. Maximum circulation. 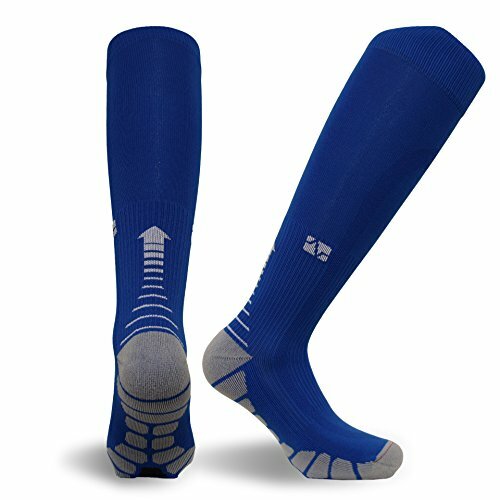 Best compression range-compression for maximum circulation and comfort this ideal range is the most beneficial for running, cross fit, walkers, pregnancy, maternity, Vein support, marathons, sports, gym, yoga, Spartan, standing, working, sitting, or sleeping, always increasing stamina and faster recovery 4 way stretch- try it -pull both directions, if it is shorter in one direction that is only 2 way stretch. Our socks stretch both directions for consistent compression throughout the entire sock, if they are too long, just grab both sides of your calves and slide them down to just below your knee. Each pair is hand tested in our factory for performance, they are washed in a fabric softener with a nice fresh scent making our socks ""ready to wear"" right out of the box. 100% made in Italy- since 1998 Vitalsox the leader in technology and Real tested graduated compression socks. Made from start to finish in our own factory never outsourced to the lowest bidder or built using machines designed for other products with inferior low priced non tested materials. Performance does make a difference, guaranteed quality that stands out in your sock drawer. The best compression socks at any price. If you have any questions about this product by Vitalsox, contact us by completing and submitting the form below. If you are looking for a specif part number, please include it with your message.